Be the first to share your favorite memory, photo or story of Byron. This memorial page is dedicated for family, friends and future generations to celebrate the life of their loved one. 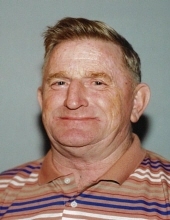 PITTSFIELD-Byron “Red” B. Ballard Jr, 85, died peacefully with his family by his side on Wednesday, April 10, 2019, at his home in Pittsfield. He was born on August 10, 1933, in St. Albans, Maine, a son of Byron and Meredith (Welch) Ballard Sr. He was employed at the Tannery for over 44 years working as a color wheel operator. He also worked as a saw mill operator and farmer, raising cows, pigs and selling hay. He is survived by his loving wife of 66 years, Carolyn Ballard of Pittsfield; daughter, Kathy Vanadestine and husband Terry of Pittsfield; son, Randy Ballard and wife Lisa of Hartland; 13 grandchildren; 22 great grandchildren; brothers: Bruce Ballard and wife Rosemary of St. Albans and Elmer Ballard and companion Patricia Davis of Gorham; sister, Bertha Donlon and husband Bill; and nieces and nephews. He was predeceased by his parents; three sons: Jimmy, Steven and Joseph; and great grandson, Riley. The family will receive friends from 2-4 p.m., Sunday, April 14, 2019, at the Shorey-Nichols Funeral Home, 191 Hartland Avenue, Pittsfield. A graveside service will be held at 10:30 a.m., Friday, June 14, 2019, at the Village Cemetery, Peltoma Avenue, Pittsfield, with Pastor Kevin Brooks officiating. To send flowers or a remembrance gift to the family of Byron "Red" Ballard Jr, please visit our Tribute Store. Guaranteed delivery before Byron's graveside begins. "Email Address" would like to share the life celebration of Byron "Red" Ballard Jr. Click on the "link" to go to share a favorite memory or leave a condolence message for the family.